It’s been pointed out to us that CleverstiX featured in both the Sunday Mirror and the self-proclaimed “Scotland’s biggest-selling, best-read Sunday Newspaper“, the Sunday Mail at the weekend. 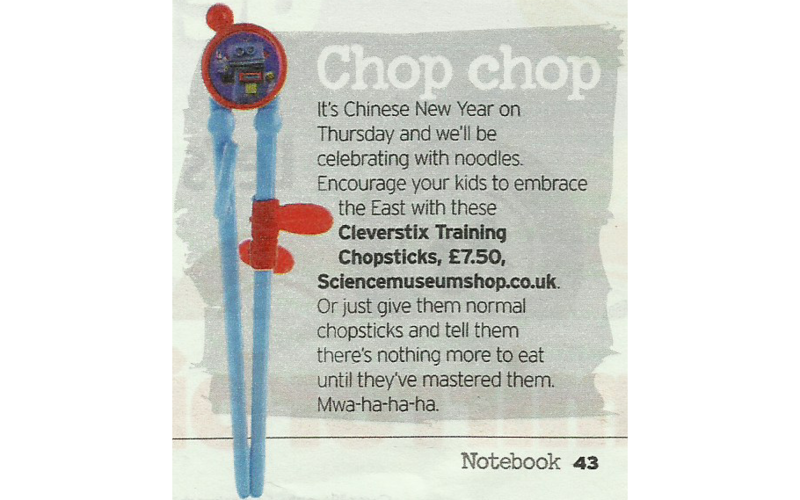 The “Food Notes” section of the ‘Notebook’ supplement magazine published on 15 February commented on the seasonal topic of Chinese New Year by advocating the Science Museum version of our Child Development Chopsticks to help kids celebrate. CleverstiX.com would like to thank our readers for alerting us to these articles! If you spot CleverstiX in the press or media please do let us know via our ‘Contact Us‘ page.